Hiking the trails as we do in the northeastern United States, our eyes constantly search for butterflies. We may all react as I do when approaching this wildflowering plant. I have come to generally disregard Vernonia noveboracensis. Why? Aren’t its blooms gorgeous? Yes, they are striking. Isn’t New York Ironweed one of the last of the late flowering wildflowers, joined by asters and goldenrods? Yes, again. With dozens and dozens of flowers clustered on these erect stems, they receive only infrequent visits from butterflies. A puzzlement. Open from August to as late as October, they are not the first stop destination for our winged beauties. O. E. Jennings (1953) may offer us a clue, Grazing farm animals, even sheep, avoid this plant, probably because of its bitter foliage. This observation was made for the closely related Tall Ironweed, but perhaps it describes New York Ironweed also. Then who does nectar regularly at these striking blooms? This year’s woefully limited Monarch population certainly did not consume much of their nectar secretion. Does that influence next year’s New York Ironweed presence? A pretty plant, with a mysteriously low profile. Last week during the NABA butterfly count, Pat Sutton pointed out to our group a similar-looking plant in the Francis Marion National Forest and referred to it as Joe Pye Weed. On Friday Jeff Kline, a neighbor and fellow lepidopterist / NABA member and I returned to that place and saw the same plant. Then we tried to identify it. Not an easy job. 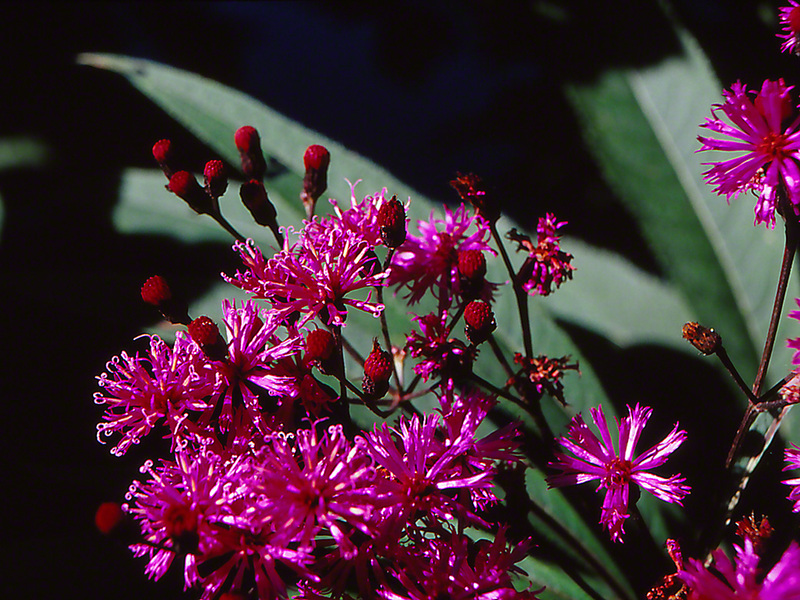 The “eupatorium” name has been abandoned, and now a dozen possible genus + species combinations are found at http://plants.usda.gov/java/nameSearchas “Eupatoriadelphys” and the Lady Bird Johnson link helps somewhat with better pictures. What you’ve posted, the vernonia, looks much like the Joe Pye Weed, and the Lady Bird pictures at http://www.wildflower.org/plants/result.php?id_plant=VENO have me wondering: what exactly ARE we looking at here in SC? By the way, Loren is in the air right now returning to Tel Aviv. He spent three days with us. He meets lots of people thanks to his cousin Dotan, who is a completely, totally goofy guy. However, Dotan is a full-time pilot in the Israeli Air Force and flies two types of aircraft: refueling tankers and coastal spotting jets, and this makes him “very fascinating” with, well, everybody. Dotan told Loren that with all the foreign warships and aircraft in the Med right now, he flies very close to, or in, the air space of many of them. Most such military pilots — French, Turkish, German, Italian, Greek, etc.